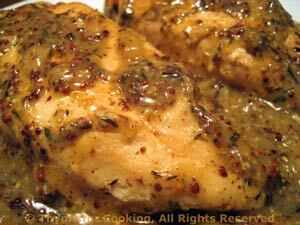 Chicken with Whole Grain Mustard, from Thyme for Cooking's Weekly Menu Planner. I use Dijon-style mustard a lot in cooking, but, occasionally I prefer the taste of whole grain mustard. 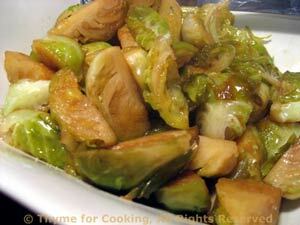 Simple braised potatoes and quickly cooked Brussels sprouts round out the dinner. An Italian winter classic: potatoes braised in white wine with rosemary and just a bit of tomato added at the end to add interest to both the flavor and the color. Scrub and slice potatoes thickly, 1/4" (.5 cm). Peel and slice garlic as thinly as possible. 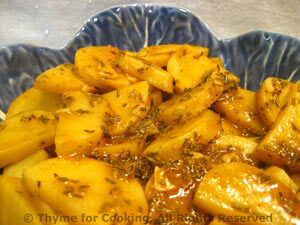 In a medium saucepan, sauté potatoes and garlic in olive oil until lightly golden, about 10 minutes. Add wine, rosemary and simmer, uncovered, until wine is almost absorbed, 15 - 20 minutes. Mix the stock and tomato together and stir in. Simmer until thick and potatoes are tender, about 10 minutes longer. Quartered Brussels sprouts cook in very little time, which helps avoid the strong taste they develop with prolonged cooking. These are simply finished with a bit of brown sugar and vinegar. Trim Brussels sprouts: slice a bit off of the stem end and peel away the outer leaves - any that are damaged, wilted or discolored. Cut into quarters. Add sprouts and sauté for 5 minutes. Add water, cover and simmer 5 minutes longer. Uncover and cook off water. Add vinegar and sugar, stir until sugar is dissolved and simmer to blend flavors, 2 - 3 minutes longer.